We are delighted to announce that Danny Butterfield has accepted our invitation to become our President. Danny joined Exeter City in September 2013 as an experienced right back but has also played at centre back and in midfield during his time with the club. He was appointed as player-coach in the summer of 2015 and was in charge of the U21 team who defeated Southend by the impressive score of 6-0 in the 1st qualifying round of the Premier League Cup just a few weeks ago. ECDSA chairman, Nick Saunders said ‘We are very grateful to Danny in accepting our invitation to become our President and his support in helping us achieve our objectives for all those with disabilities and is very much appreciated. In recognition of this ECDSA has agreed to sponsor Danny’s training kit for this season’. Danny has taken over the role of ECDSA President from Pat Baldwin who left the club in the summer. Mental health will be the focus at Exeter City’s specially designated One Game One Community match at home to Stevenage on Sunday 11 October (kick off 12.15pm). A series of initiatives will take place including at half time, the national launch of the new Mental Health Charter for Sport and Recreation as part of the celebration of World Mental Health Day. The Charter is backed by the Professional Players Association, the Sport and Recreation Alliance, Time to Change and Mind. Exeter City FC will be joining 190 other organisations in signing up to the charter. The Exeter City Supporters Trust’s One Game One Community Group and Exeter City’s Football in the Community team have been working in partnership with Mind in Exeter and East Devon and the national equality organisation Kick it Out to raise awareness of mental health issues at the match. Everyone here at the Exeter City Disabled Supporters Association fully supports this great event. * The players and officials warming up in Kick It Out T-shirts with the slogan ‘Lace your boots for mental health’. * Specially invited guests including people with mental health challenges, their families and carers. 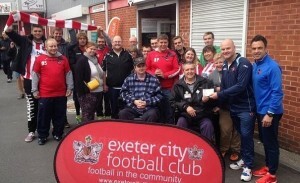 Members of Exeter City’s Ability Counts disability football teams will be present too. * The Exeter City supporters group, the ExEC Club, hosting a group from Exminster based New Leaf, part of the Devon Partnership NHS Trust which offers therapy, training and supported employment to people living with a mental health condition. * Stalls in Red Square promoting mental health services hosted by the local NHS Depression and Anxiety Service and by Recovery Devon. * Features on mental health in the official match day programme. 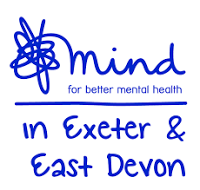 * A bucket collection for Mind in Exeter and East Devon. * A new commitment between Exeter City Football in the Community and Mind in Exeter and East Devon to bring the benefits of activity to people accessing Mind in Exeter and East Devon. Exeter City’s One Game One Community Ambassador first team player Ollie Watkins said “I am delighted to be supporting this initiative. Mental health is an important issue and we need to do all we can to raise awareness and ensure it is better understood and acted on”. 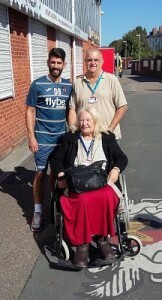 Mind in Exeter and East Devon’s CEO Ruth Wells said “We are so grateful to Exeter City F.C. in their commitment to work with us on our “Lace Your Boots for Mental Health” to ensure that nobody faces mental health difficulties alone and to harness the power of sport”. Exeter City Disabled Supporters Association (ECDSA) are committed to helping disabled visitors to St James’ Park whether they visit on a match day or at any other time for meetings or conferences. One of the things that we have done is to fund the purchase of a number of wheelchairs over recent years and have made these available for use should visitors find that their own wheelchair becomes inoperable or if an urgent requirement arises for someone to have need of a wheelchair. The bad news is that we’ve got to report that two of the wheelchairs it has previously provided have been damaged beyond repair and a third wheelchair has vanished completely. Up to now the wheelchairs have been placed in the WTS stand and have been free to use by anyone, which has led to them being abused and not used for their intended purpose. The great news is that we’ve now provided funding for a new ‘attendant style’ wheelchair. This will now be kept safely behind the club reception in ‘the park’. Refundable Deposit – The new wheelchair is now available for ‘hire’ at NO COST to the hirer. All we ask is for a deposit, which will be refunded upon the safe return of the wheelchair at the end of your visit. Who are Ability Counts FC ? Exeter City FC Ability Counts offer adults with mental health issues, learning difficulties and physical impairments the opportunity to engage in regular, structured, professional and fun physical training sessions. The registered players compete in a variety of training sessions and competitions in which they play against other players with the same disabilities. Our sessions aim to increase confidence, self-belief, physical fitness and health and well-being. Dawlish Leisure Centre on a THURSDAY evening from 6.00pm-7.00pm. The first session is Thursday 22nd October. Cost is £3 per person per session. For more information visit – Ability Counts FC website. Nick Saunders says “We’re delighted to help Ability Counts FC with this donation towards their operating costs for the 2015-16 season. 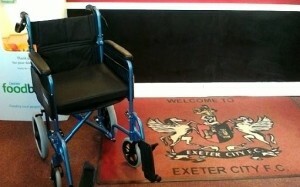 Helping others with disabilities who operate under the Exeter City banner is what we’re all about. Everyone here at ECDSA hope that Ability Counts FC have a successful and enjoyable season’. WAS DONATED DURING THE HALF TIME BUCKET COLLECTION AT THE CRAWLEY TOWN MATCH ON SATURDAY 14TH NOVEMBER 2015. Chairman Nick Saunders said “This is a fantastic amount to have collected in just 10 minutes during half time. On behalf of ECDSA, I would very much like to thank the supporters of the club for their overwhelming generosity together with all those who gave up their half time cup of tea to undertake the collection’. As mentioned in the Crawley Town match programme, half of the proceeds from the Bucket Collection is being donated to the Exeter City FC Ability Counts Football Team as they are in real need of funds to continue playing this season. A presentation was made at half time at the Bristol Rovers match on Sat 28th November when a cheque for £200.00 was handed over by ECDSA committee members to representatives of Ability Counts. 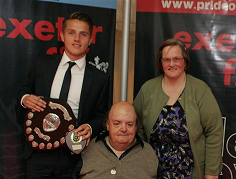 Exeter City Disabled Supporters Association and everyone at EXETER CITY was saddened to learn that long-time committed supporter David Turner recently passed away at the age of 60 on 11th December 2015. David was a bright personality familiar to most regular visitors to St James Park, and was a member of the Exeter City Disabled Supporters Association committee. David’s funeral is on Wednesday 13th January 2016 @ the Exeter Crematorium at 2.45 p.m. Dress code is what you want to wear with Exeter City FC colours welcomed. David has requested that donations in his memory be made to the Exeter City Disabled Supporters Association (any cheques, please make payable to: ECDSA), no flowers. 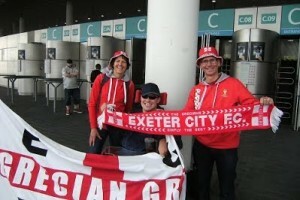 Exeter City Disabled Supporters Association (ECDSA) members Trevor & Sue Harwood had an unplanned meeting at Wembley Stadium on 08/09/15 with fellow ECDSA member Greg Hill. 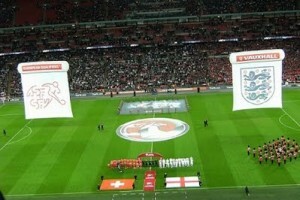 The occasion was the England v Switzerland Euro 2016 qualifier – the game in which Wayne Rooney scored his 50th England goal and surpassed Sir Bobby Charlton’s record which had stood for 45 years. Trevor said ‘It was great to meet Greg and his family so unexpectedly at Wembley. I always buy my copy of ‘The Grecian’ from Greg on match days at the Park from his pitch by the ticket booth between the WTS stand and the Big Bank. It’s just great to say – together we witnessed history when Rooney broke the record – we were there’. 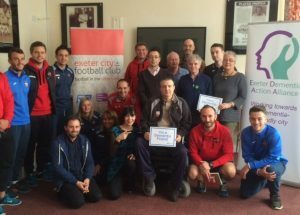 Exeter City took the first steps towards becoming a ‘dementia friendly’ football club by hosting a dementia awareness workshop on Thursday 21st April, 2016. Gina Awad from the Exeter Dementia Action Alliance led the session which was attended by Club Directors and staff, Supporters Trust Trustees, Football in the Community staff and others from the Grecian family which includes our own chairman Nick Saunders who is also the clubs Disability Liaison Officer as a volunteer. Everyone present agreed to become a ‘Dementia Friend’ and help change the way people think, talk and act about dementia. The next step will see the Club, the Trust and Football in the Community all apply to become members of the Exeter Dementia Action Alliance. Part of this process will be the production of action plans to set out how the various parts of the club can become more dementia friendly. Gina Awad said “It is so good to have Exeter City Football Club committing to this important agenda. It was really inspiring the way people at the workshop were willing to share their personal experiences and agree to be dementia friends. This is vital as with support, people with dementia, can and do take an active role in life”. Paul Farley, Exeter City Football Club’s lead director for equality, inclusion and safeguarding said “I am so proud that we held this workshop and are going to join the Alliance. Dementia is one of the great social issues of our time and as a supporter owned community club it is absolutely right that we get involved”. George Friend; Dean Moxey; Liam Sercombe; James Dunne; Scot Bennet; Artur Krysiak; Tom Nichols and last year’s winner Jordan Moore-Taylor. Members have been voting again for the player whom they believe has improved the most over the season and we’re please to announce this season’s winner. In 2nd Place we have Jordan Tillson. The WINNER by the biggest margin since the award was started, we have someone who has come on ‘leaps and bounds’ this season and in that time has scored some outstanding goals and what can you say about the winning goal vs. Argyle “and no it was not lucky Mr Adams”. Ollie was presented with his award at the Exeter City ‘End of season Ball’ on 8th May by our chairman Nick Saunders and our award sponsor Steve Gazzard. We would like to thank our members for voting again this year. If you missed out don’t worry as there will be another chance to vote at the end of next season. Hello & welcome to this the 9th Annual General Meeting of the Exeter City Disabled Supporters Association and the following is my report as chairman. Last season was a very sad one for our association with the very sad passing of our dear friend and fellow committee member David Turner, it was a massive shock and we miss him dearly. Our condolences have been sent to his family and to his wife and fellow committee member and friend, Juanita. Ambassador: England Premier League & FIFA Assistant Referee Mike Mullarkey is still our ambassador and over the past year Mike has been very busy with his footballing commitments and has sadly been unable to help us as much as he would of liked but we totally understand this and we’re hoping to work with Mike in the coming season on another event like we had a couple years ago, namely ‘Game of two halves’. Mike would have been here this evening, however he’s taking a well-earned holiday with his family as he’s just come back from officiating at the Euro’s in France. President: Danny Butterfield became our president last season taking over from Pat Baldwin. 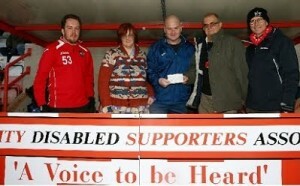 We thanked Danny for his support of our association and we had the pleasure in sponsoring his training kit. Wheelchair for hire: As we’ve had two of our chairs damaged and another one vanished we decided to buy an attendant style wheelchair and this is safely stored behind the main club reception. Ability Counts Football Team: We invited Scott Walker who deals with the Ability Counts Team on behalf of the clubs FiTC to one of our meetings and Scott informed us in detail about the many changes that has taken place with the team and that they’ve a new team coach. After the meeting we decided to sponsor the team as their running cost per year is around £3,000 and they don’t get any financial help from FiTC. More on this in our Treasurers report. Bucket collection: The football club kindly gave us the Crawley Town game on 14th November for our annual bucket collection. We decided that we would split this 50/50 with the Ability Counts Football Team. Level Playing Field membership: We continue to be fully paid up members and this ensures we get the advice and support we need to sort out any disability issues which may arise and this was the case this year. Our website: We’ve had to change our website provider as we had run out of storage space with Google Sites. Myself, with fantastic help and support from Trevor’s Nephew, Pete Jones was able to generate a new website by using WordPress and at no cost to our association. Pete has kindly sponsored the site by buying us our own domain name, namely ecfcdsa.co.uk which helps people greatly in finding us. We’ve received many positive comments on our efforts and the website is looking really good and it’s a lot easier to use and is smartphone and tablet friendly. A big thank you to Pete for his help and generosity. Re-development: Jeanne & David Jones and myself have had meetings with the developers and when the main plans were submitted to the local council a lot of our concerns were not considered, which was very disappointing and worrying on our part. Since then, we’ve had a couple of meetings with Justin Quick to discuss the many issues we’ve got with the plans and Justin has taken these concerns on board and he’s now working with us in meeting our concerns. One thing Justin was surprised at was the lack of vision that someone in a wheelchair has of the pitch if a designated area was at pitch level and if the new boarding around the pitch is built too high. We hope with Justin’s support and help, our concerns will be met. As the cost of the redevelopment has to be kept down there are things we can help the club with like Radar Key Locking Systems for the accessible toilets and electronic LED Scrolling Message Boards which will help so many people. 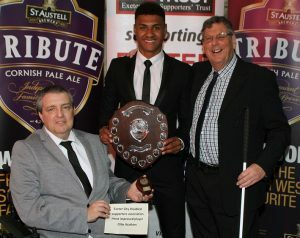 Most Improved Player award 2015/16: Members were asked again to vote for their ‘Most improved player of the year’ and this year’s winner was Ollie Watkins by a very big margin. The trophy was presented to Ollie by myself and our trophy sponsor Steve Gazzard at the clubs end of season ball. Match day accessible parking: We continue to allocate accessible parking on behalf of the football club. This ensures that all spaces are used on a match day by those with disabilities. We’ve continued our ties with other supporter groups and this year we nominated the ‘One game, one community’ group to become Grecian Group for 2016 which we’re glad the club agreed with us and awarded them the Grecian Group award for 2016. The East Devon Grecians continued their support of our group by continuing their membership with us. Also not forgetting our work with the ‘One game, one community’ group; Supporters Trust and the football club. Membership to our association is at a steady level of 65 members. We’ve still got high hopes of getting over 100 members, which will be achieved one day. Our association is still involved with the South West Disabled Fans’ Experience Forum as founder members with last year’s forum taking place at Cardiff City and it was another great success. Plans are afoot for the next forum, which is being held at Bristol City on Thursday 13th October, 2016. Sadly I won’t be helping with the planning of future forums as I’ve stood down as co-chair. It was never my intention to co-chair the forums but to help set things up and then pass the reins over to others. Before I stood down I was invited by Kieran of Level Playing Field to attend the first South Coast Disabled Fans’ Experience Forum which was held at Portsmouth FC by LPF as this was their first regional forum based on the South West forums. Since the launch of the South Coast forum a Walsh forum has also taken place at Newport County, again based on the South West forum. So I leave the forums in a fantastic place and others will hopefully continue on its success. Diversity & Equality training: Last summer Exeter City; the Trust and FiTC with myself included, took part in D & E training which was provided by the Football League under a new scheme to be rolled out to all clubs to acquire a D & E standard. Only a handful of clubs were chosen and Exeter was one of them to test the scheme and the great news is that the club passed and received the first standard mark and are now working on gaining the next level. The club will be checked on in 2 to 3 years’ time and it is hoped by then the club would have met the criteria for the next standard mark. Mental Health: One game, one community groups designated match focused on Mental Health and at that match there was a national launch of a new Mental Health Charter for Sport and Recreation as part of the celebrations for World Mental Health Day. The Charter is backed by the Professional Players Association, the Sport and Recreation Alliance, Time to Change and Mind. Exeter City FC has now joined other organisations in signing up to the charter. Dementia awareness: In a move to raise awareness for people who suffer from dementia, Exeter City took the first steps towards becoming a ‘dementia friendly’ football club by hosting a dementia awareness workshop. Gina Awad from the Exeter Dementia Action Alliance led the session which was attended by Club Directors and staff, Supporters Trust Trustees, Football in the Community staff and others from the Grecian family which included myself as your chairman and as the clubs Disability Liaison Officer. Everyone present agreed to become a ‘Dementia Friend’ and help change the way people think, talk and act about dementia. Steps will see the Club, the Trust and Football in the Community apply to become members of the Exeter Dementia Action Alliance and part of this process will be the production of action plans to set out how the various parts of the club will become more dementia friendly. 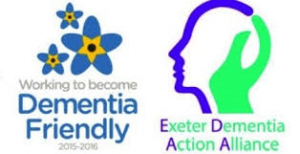 The fantastic news within the close season is that all parties have been accepted as Dementia friends and an action plan is now in place that makes the club Dementia friendly and means the club will be working closely with the Exeter Dementia Action Alliance. At last year’s AGM we were asked a question by the late David Turner about Accessible Away Travel and true to our word I’ve looked into this with great detail and I must say it has not been easy. On to some good news, one of the organisers of Grecian Travel has informed me that they’ve been able to find a coach company in Yeovil that has a 75 seater coach and accessible for 1 wheelchair user and accessible to those with other disabilities. I know it’s only 1 wheelchair space, but it’s a big step in the right direction. This coming season is going to be a proud moment for our association as on 18th April, 2017 it’ll be our 10th Birthday and we hope to plan an event to tie in with this fantastic milestone and also 10 years of service from myself; Jeanne & David Jones as the only remaining founding committee members of our association. I hope as your chairman I’ve fulfilled what is expected of me and I hope to be re-appointed as your chairman which will be my 10th year as chairman. I’ll ensure that all supporters with disabilities and their personal assistants are treated fairly with the fantastic help and support from the committee, ensure that the club are kept on their toes on disability issues which you would rightly expect. I’ll also ensure that we continue to do our bit in helping and supporting Exeter City Football Club in any way possible and that when any re-developments take’s place, everything complies with Accessible guides. I would like to thank our committee for all their hard work and time given for the benefit of our members and Exeter City over the past season, Mike Mullarkey and Danny Butterfield for their great support of our association and to all our members for the continued support given and to Exeter City Football Club for allowing us to use their facilities, again for free for our meetings and finally to you all for attending this year’s AGM.